Mapenzi is a swahili name for Love or Romance. Mapenzi Beach Club, also referred to as Mapenzi Beach resort or Sandies Mapenzi beach Hotel/ resort enjoys an idyllic location on the North East coast of Zanzibar. 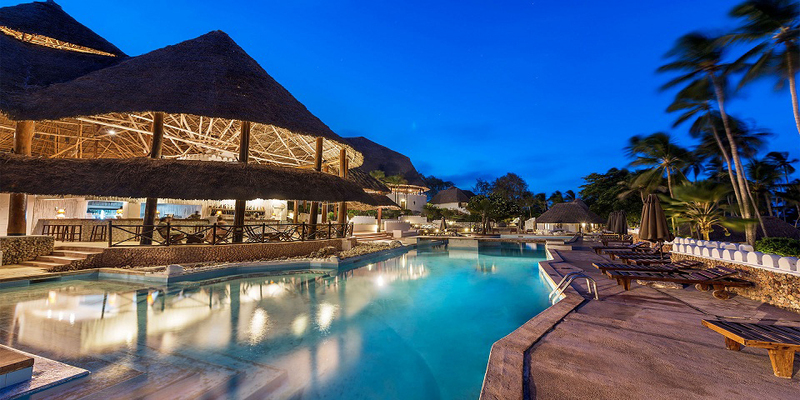 Mapenzi Beach resort, is hideaway enjoying excellent, delightful white sandy beach, kissing turquoise warm waters of the Indian Ocean hence the name sandies. Due to its location, some will say it is in the North Coast and others in the East Coast . The hotel is located 45 Km from the airport. Mapenzi Beach Club lies on four hectares of pink bougainvillea and elusive coconuts trees. 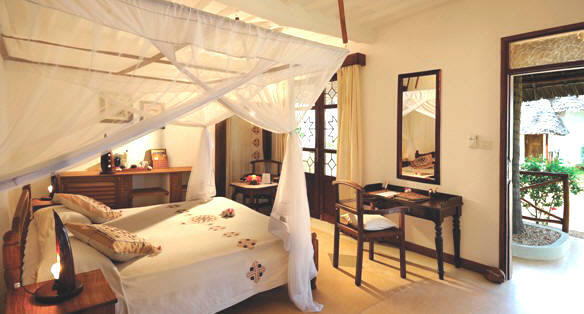 It has airy thatched African style bungalows are luxurious furnished each with a door leading onto private patios. IThe architecture is traditional East Africa with coral walls and intricately curved wooden decor. Located some distance away from other hotels in the area, Mapenzi Beach Club means a long stretch of tree-fringed beach shared only with the local fishermen on their bicycles. Single room supplement is 45% reduction of double room rate. Triple rooms available on request. Minimum stay 5 nights from 23Dec 2010 to 6 Jan 2011. The rates are all inclusive of accommodation, meals, soft drinks beers, house wines, selected spirits, beverages, welcome drinks and activities. A child from 0-11 years sharing with parents stays free. And additional child pays 50 % of adult sharing. Accommodation at Mapenzi Beach Resort Zanzibar comprises of 87 rooms including: 30 Sea Front Rooms, 36 Standard Rooms and 21 Garden View Rooms. Set directly on the beach, serves fresh pizza and salads, soft drinks, house wine, local beer and juices. Open for dinner only. Reservations before 02:00 pm with Guest Relations, Restaurant Supervisor or beach bar Staff. First dinner included in package, thereafter USD 10 per person. Seafood a’ la carte Restaurant. For your special romantic candlelight dinner under the open skies. Reservations before 02:00 pm with Guest Relations, Restaurant supervisor or Beach bar staff. Mapenzi beach Resort facilities include, Hibiscus Massage Centre, Meeting Room, Internet Services, swimming pools and many more. In Africa, rain gives life and life depends on it…Rain is the gift that brings simple wealth to the earth and all those on it. Rain refreshes in the still heat of the day, it cools thirsty land, awakens the senses and sharpens the aromas of the bush. Capturing the beauty and magic of African décor, Mvua African Rain Spa blends earthy colors and dramatic images to evoke a sensory journey and invites guest to build a personal experience in its calming space. Here you will find everything you need to soothe body and mind. At Mvua African Rain Spa we utilize indigenous moisture – nourishing natural ingredients and other native resources such as plants, flowers, salt, grains, spices, wild honey and raw sugar. Our tempting choices of treatments are based on ancient African, Asian and European traditions designed to soothe the spirit, rejuvenate the body and enrich the mind. After experiencing the attentive service and warm ambience, you will not want your visit to Mvua African Rain Spa end and you will return again and again. Mvua African Rain Spa is an experience like no other.